Well, it seems that he is always on the lookout for new heroes. To use. Ruff day? I’d say so..
Yay! The Surprising Plug-and-Play Head finally enters the main story! “McIntosh” You’ve been waiting to use this joke haven’t you? His parents and teachers always adored him, he was the apple of their eye. and he’s not peeking in windows for his jobs requirement. Pfft. He’s just an android, with a chrome badge. I’ll admit he’s got big brass balls…his coworkers are usually Unix. His name is McIntosh, and he has a Mac monitor for a head… nice. 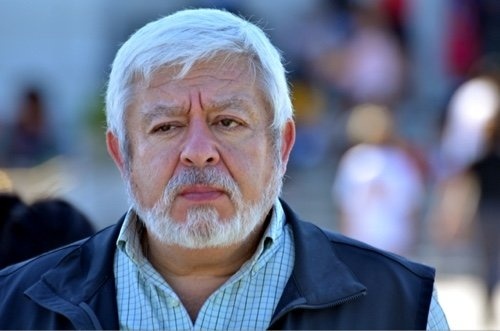 I KNOW this is just an absurd coincidence, but the fact that the Chief looks quite a lot like Mexico’s very own investigator of the paranormal and extraterrestrial beings – Jaime Maussan – is just friggin awesome. It was bound to happen , Neil is being called in for not being in CLASS. I hope that He get’s to know Senpia ” The other Magical Girl”. I fear that Neil will in the same class as VD. hey it’s Mr Roboto. Domo Arigato Mr Roboto. Quick! Say PC is better and escape in the frothing rage it generates! I can only guess at the end results of this conversation. Jo: I have good news, bad news, and news that I am uncertain how you will take it. First the good news. Volt Dynamo got his license suspended. Now the bad news. The NSR suspects the new super’s has a connection to Neil’s mom. Now the uncertain news, Volt Dynamo has been sent back to school. Meh. I still prefer monitor man but this pun works too. It’s horrible but it works. The NSR must have a special section for “magical girls” and other foreign heroes.Maybe Mr.McIntosh will find a way to make Neil’s mom human again or do you prefer her as a bunny rabbit?!?!? I mean, a guy with a computer screen as a head? Just for the sake of a joke?